Twenty or so years ago a team of Ripon Runners ran the Coast to Coast as a continuous relay, night and day. Mobile phones were still analogue so communications were difficult but in spite of runners often being unsupported the run was successfully completed. 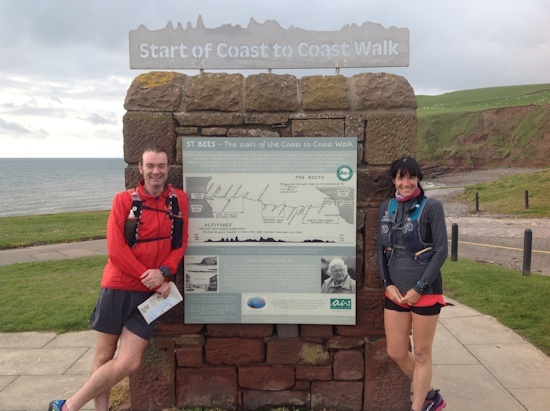 This October 2016, Claire Baker and Matt Holt ran the Coast to Coast over 5 days, which is about 40 off-road miles daily. Although they had overnight stops (5* hotels or bivouacking?!) the same pair ran the whole distance, which must be a running first for RRs. Claire’s account and that of the support team, Jonathan, appeared on Facebook at the time of their run. Inspired by Matt and Claire I feel that it is time Ripon Runners tackled this route again, either as a relay or as a multiday run with support so runners can opt out of sections if they wish. Alternately we could consider the shorter Hadrian’s Wall route? What do runners think of these ideas for a future club event? Comments to Simon or me please.